Specifically, I’m dreading the queues. Endless, winding queues, lasting hours, all to ride a roller coaster for two minutes. There should be an easy solution to this: ride pricing. A long line indicates an underpriced experience. At any given moment, many more people want to ride than the ride can accommodate. By charging for individual rides, demand can be rationed until the queue is winnowed down to something reasonable, like five to ten minutes. The pricing could even vary. Operators could reduce prices for underused rides until more users are attracted, the better to keep activity evenly distributed around the park. priced in tokens. You could then sell additional bundles of tokens for the real ride enthusiasts. I seem to recall that the old state fairs I used to visit operated on this system and didn’t have long queues. Ryan’s idea sounds suspiciously familiar to this Southern California native. Throughout my childhood we visited Disneyland every year on my sister’s birthday, and since Walt Disney was no communist he made sure that if you wanted to get on the more popular rides you had to pay for the privilege. This wasn’t done via tokens, however, it was done via ticket books. You could pay for admission by itself, or you could pay a few dollars more for admission plus a book with a limited number of A, B, C, D, and E tickets. A and B tickets were for the junky rides. We always came home with a bunch of unused one. E tickets were for the Matterhorn or the other good rides. If you ran out you could buy more inside the park. 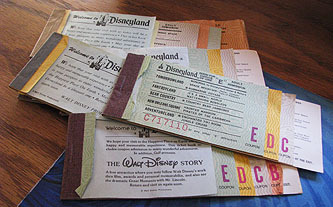 Disneyland ditched the ticket books in the early 80s and went to a simple admission charge that included unlimited access to all rides. The reasons were obvious: they made more money since everyone now paid the higher admission price, and they saved money since they didn’t have to print ticket books, hire people for ticket booths, or collect tickets at the rides. Which is all well and good, but the bigger question is: Did the ticket books cut down on queuing? Answer: Not as far as I can tell. The line for the Matterhorn or Space Mountain was miles long back in the 60s and 70s, just like it is today. In theory, ride pricing should work. In practice, I think theme parks might represent a market failure.